The University of Louisville Cardinals woke up on Groundhog Day, the morning after a season redefining 71-65 W over North Carolina, not having to worry whether some previously anonymous groundhog (a/k/a whistlepig, a/k/a woodchuck, a/k/a Marmota monax) in Puxnawhatever, Pa. sees his/her shadow. After a weekend of soul searching, during which the Cardinals tempered their steel, while their fan base was wondering whether they might have to find some non basketball endeavors to occupy their time in late March, a major question was answered. 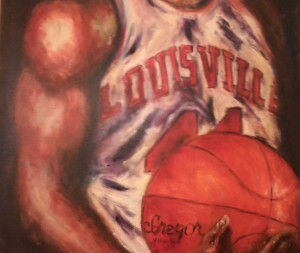 This U of L team may go down, but it will not be for lack of effort, or the lack of will to fight back. Here’s what Louisville did to the Tar Heels, in front of 22,781 Yum! fans who turned raucous once they found their seats. They limited the visitors with the nation’s second best assist/ turnover ratio to 11 assists, while forcing 16 turnovers. Against a Roy Williams’ team, noted for scoring in transition, noted for its fabled “secondary break,” U of L strangleheld them to but 6 fastbreak points, 0 in the first half. The Cards held the team leading the ACC in scoring at 85.8 ppg to 65, forcing them to miss 38 of the 58 field goals they attempted (34%). Fifty four hours after being schooled by Virginia, being lectured Cavalierly then failing the sternest test to that point of their collegiate hoops careers, here’s how Louisville’s Cardinals responded against #1/#2 North Carolina. They outshot the baby blue visitors by 9% from the field, hitting 53% after intermission when the going got really rough. They scored 17 second chance points against 7. The Cards’ subs outscored NC’s vaunted depth from the pine, 20-14. The Cardinals tallied 36 points in the paint, versus 24 for the vanquished. U of L prevailed by 6, against their highly regarded visitor, matching the total deficit of Carolina’s previous two defeats. Louisville was -7 at the free throw line, missed a few crucial front ends of 1+1s, yet never withered. Despite a botched Sosa play right before intermission — Had he gotten the rock a second earlier, Anas Mahmoud would have had scored with a +1 — Louisville held a single digit advantage. Then, Louisville started strong in the second, pulling away by five. Carolina didn’t fold . . . yet, immediately knotting the score, then taking a short lived lead. Between the initial timeout after the break, with the game tied at 34 all, and the next stoppage for commercials, when U of L led 41-40 thanks to a Donovan Mitchell 3d chance tip, it was Game On! But, the salient point to be made is this: After that juncture with 15:44 to play, Louisville never relinquished the lead. Yes, Carolina knotted it at 45, even had a possession to take the advantage, but the Cards did not wilt. A Mitchell J at 12:07 pushed the Cards to 47-45. NC never came closer the rest of the way. As encouraging as any aspect of this important win is the reality that Louisville played far from flawless basketball. The Cardinals beat one of the nation’s best, and it didn’t take their best possible performance to do it. Again, Louisville left a lot of points at the Charity Stripe. The Cardinals coughed the ball up almost as much as their adversaries. Foul trouble continues to plague. Trey Lewis continues to dribble too much, forging into No Man’s Land too often. The freshmen, Ray Spalding and Mitchell, still make silly errors in both judgement and execution. Chinanu Onuaku still fouls. Eight of Lewis’s 9 points came literally at crunch time, in the final 7:08. A corner jumper to put the Cards up 7, 58-51. A driving layup for a 60-53 lead. Another at 1:42 for a 67-61 margin. And, arguably, the most important two points of the game, the conversion of 1+1 with :26 on the clock for a four point — Read: Insurmountable — advantage. Such would have been the cacophony had Ray Spalding converted his steal and breakaway slam to push the Cards up 10 with 4:59 to play, the authorities might have needed to check the Yum!’s foundation for cracks, its support beams for fractures. But, he was pilfered, when he tried to take it end to end himself. Carolina scored immediately, for a four point turnaround. But . . . on the ensuing Louisville possession, Spalding took the rock right to the hoop. Missed the shot. Got his own rebound. And scored on the follow. Onuaku, despite his foul trouble, which has become a vexing habit, tallied a key +1 with 5:15 to play, and finished with another double double, 12 and 10. Which brings me to the Stars of the Game. 7 (Seven) assists. Only 1 turnover. It’s worth repeating. Q had 7 assists, and only gave it up once, against North Carolina’s vaunted traps and various and sundry defensive roadblocks. His Vidalias were on display from the get go, when he drove for a slam and the Cards first tally of the evening. And, of course, his highlight reel midcourt steal, and stop and pop from 30 feet to pull the Cards within a point at 23-24.1 Then consecutive treys to keep the Tar Heels at bay midway through the second. 24 points (8/12, 4/7 on 3s, 4/4 at the line). 5 rebounds. Which scoring output, just for comparison’s sake, matched the total of Carolina’s dynamic duo of Brice Johnson (15) and Marcus Paige (9). Donovan Mitchell was huge with 10 points and five boards in 18 minutes of action. The future is now. Spalding and Mahmoud never backed down. Then there was that behind the back AM assist to Lee. Deng Adel scored but one bucket, but it was key, a fall-away jumper to give U of L its halftime lead at 28-27. Now, a few days to catch your breath Cardinal fans. Another intriguing Saturday/ Monday coming up. BC comes to town Saturday noon, looking for a trap W. Then it’s on to Cameron Indoor to battle the wounded Blue Devils on yet another Monster Monday in the ACC, still the best league in the land. 1.) Donovan Mitchell is the future AND the now. A freakish athlete, his enthusiasm is contagious. 2.) Seedy, I have no problem with Damion Lee’s reaction after his made threes. Very low-key, natural, clearly no disrespect intended to his opponents. Nothing like T. Will’s forced antics or Montrezl’s post-dunk histrionics. 3.) I watched Lee carefully before the game. He seems like a really good kid with a beautiful smile (and a very sweet game). He warmly greeted Roy Williams, and I noted that he kept his head bowed (he looked calm, serious and focused) throughout the National Anthem. A lucky find for Pitino. 5.) I’m no UNC fan, and I think even less of Roy Williams, but I love the shade of Carolina blue. It looked good in the Yum! As much as I want to hope that Saturday was the outlier and Monday was the real deal, I am not sure which way is up. Many times it has been said that you are never as bad as you look when you are at your worst, nor as good as you look when you are at your best. Truer words have never been spoken. But with that said, I am not sure the Cards played their best game last night. Is there more in the tank, more to develop to become a real threat to win the title? I am leaning toward the “Nays” since I fear we will have some real match-up problems down the line, and could easily lose 5-6 more games in the regular season. But, as I say, I am conflicted. (1) The ACC refs are horribly inconsistent. They are truly a box of chocolates–you never know what you are going to get. Even the NC fans on their message boards this morning were scoffing about a couple of fouls on Nanu. can’t sing, can’t dance, can’t act and can’t tell jokes, but universally respected by the refs for some unknown reason. (3) Ray is gaining aggression, which is good, but his 1 on 4 fast break was untimely at best and showed a complete lack of intuitive basketball knowledge at its worst. Still, I will take fierce Ray over sheepish Ray any day. (4) Q had an excellent game. He needs to become more consistent, esp’ly on the road. (5) LaDonavon Mitchellsmith will soon be a star. (6) Anas is almost worth the price of admission. What about that behind the back bounce pass on the fast break? As CRP said post-game, he had a Magic Johnson moment. And his “moves” around the basket? They are almost as comical as his attempts at making a timely free throw. (7) N.C. has a lot of quality depth. If they regain their shooting eye and Roy doesn’t get too much in the way, they have a shot at doing some big things this year because nobody really is any good. Which brings me back to being conflicted………. Donovan Mitchell I’m afraid will get too good too fast. Ricky says he will be here for four years, but I doubt that. Professor, that will only be true, if it is U of L’s last loss this season, and we win the national championship. I think this team has the resolve. Whether it has the talent or good fortune of the 1980 team is another thing. But as long as they play as hard as they did against UNCheaters, I will be satisfied. Note, as audacious as the shot was, and, make no mistake, it took serious chutzpah, there were three Cardinals streaking to the rim for the carom, should the bomb not have bullseyed.